Wheatpaste, or potato paste (also known as flour paste, rice paste or simply paste), is a liquid adhesive used since ancient times for various arts and crafts such as book binding, decoupage, collage, and papier-mâché. It is also made for the purpose of adhering paper posters to walls. Closely resembling wallpaper paste, it is made by mixing roughly equal portions of flour and water (some argue using more water or more flour), and heating it until it thickens. A similar flour and water formula is taught in elementary school (minus the low heat simmer) as an easy to make substitute for ready made adhesive. A typical application is in constructing streamers of paper rings made from colored construction paper. It can also be used to create papier-mâché. Activists and various subculture proponents (such as hip-hop, punk, communist, and anarchist) often use it to hang-up propaganda and artwork in urban areas — usually during the dead of night due to the illegality of postering other people’s property, or near traffic zones in certain cities — although it is just as commonly used by commercial bill posters, and has been since at least the nineteenth century. In particular, it was widely used by nineteenth and twentieth century circus bill posters, who developed a substantial culture around paste manufacture and postering campaigns. In the field of alcohol and nightclub advertising, in the 1890s, Henri de Toulouse-Lautrec’s posters were so popular that instructions were published on how to peel down the pasted posters without damage. Until the 1970s, commercial poster hangers always “cooked” their own paste, but since then many have bought pre-cooked instant pastes. It is applied to the backside of paper then placed on flat surfaces, particularly concrete and metal as it doesn’t adhere well to wood or plastic. Cheap rough paper, such as newsprint, works well, as it can be briefly dipped in the mixture to saturate the fibres. Due to danger of being apprehended, wheatpasters frequently work in teams or affinity groups. This process is typically called wheat pasting or poster bombing. Wheatpaste is also known as Marxist glue, probably because of the left organizations which use it; and because its ingredients are staples which can be combined by the individual, bypassing capital and industry — a true example of non-alienated labor. It is also used in fine arts preparation and presentation due to its low acidity and reversibility. 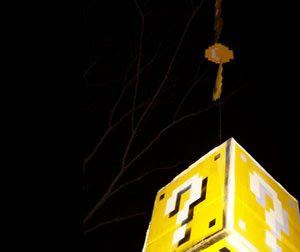 Posterchild is the nom de plume of a street artist based in Toronto, Canada who is best known for his Mario Blocks project, the purpose of which is to install homemade Mario blocks in public spaces. After being featured on Boing Boing the project has expanded as others have made and hung their own blocks. Currently Posterchild also runs his own website, called Posterchilds Blade Diary. The term comes from the fact that graffiti stencils are cut using a blade. According to the artist, “I’m not writing this diary with a pen — I’m using a blade to make my mark.” The website features new artwork every weekday, typically a stencil. Usually there is a description of the inspiration for the piece written in the style of a blog. The website also features a large collection of photos of Posterchild’s work, including sticker art, poster art, and various other creative forms of street art. There are also tutorials on how to create various types of street art. Recently, Some of Posterchild’s artwork — a series of stencils of a Betsy McCall paper doll and her dresses — was featured on the front page of the fashion section of The Toronto Star; the artwork was unsigned, which is typical of street art. Starting in November, 2006, a store was added to the Blade Diary. Merchandise featuring the artist’s stencils including t-shirts and hoodies are available. Additionally, Posterchild has begun selling canvas paintings made from his stencils on ebay.